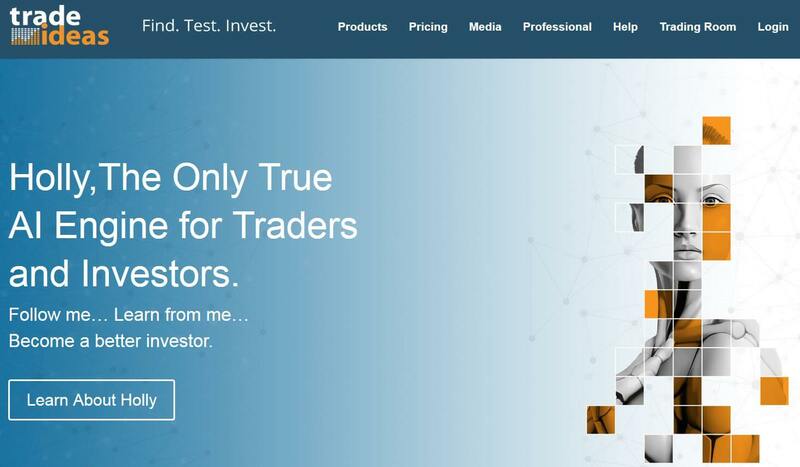 Dekmar Trades Review 2019 | Is Sean Dekmar’s Service Legit? Trading penny stocks are like navigating treacherous waters. Rouge waves can strike at any moment and gains and losses of 30% are just another day at sea. But what if you had an experienced captain steering you in the right direction? Well, Sean Dekmar claims he can do just that. Using technical analysis, advanced stock scanners and his proprietary investment strategies, With his day trading courses and services Dekmar wants to take you from a novice onlooker to a professional penny stock trader. In this Dekmar Trades Review, well tell you if he’s the man to watch or just another Wolf on Wall Street. ​Who is Dekmar Trades Best for? Dekmar Trades is a successful trading community that offers education, training and software to help you become a better trader. Rather than focus on Dekmar himself, the site functions as a collaborative community where traders interact with one another, share ideas and apply their knowledge. The chatrooms are organized so advanced traders interact and discuss high-level concepts, while beginners socialize with other beginners until they get up to speed. The site also offers an Alert Box. 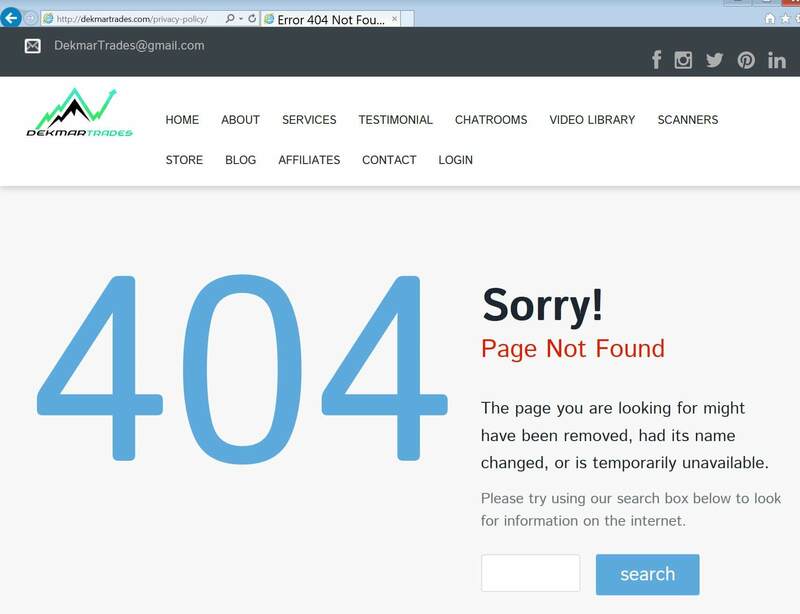 Here, traders send out signals, alerting community members of profitable trade opportunities. You’re supplied with entry price, stop loss and exit price for each trade. Dekmar also prioritizes credible information, grounded in thorough research and logic to give you a high probability of success. 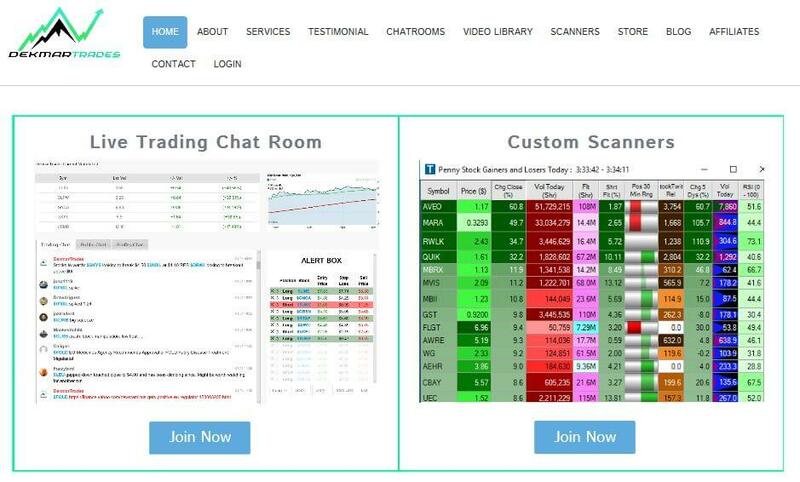 Other services include One on One Support, Updated Watch Lists, Live Stock Charting, Personal Trading Profiles, Morning Newsletters and SMS Alerts. Customer service is also essential to Dekmar’s business model. It offers a private chatroom designed for user issues and complaints. The site also has a gift shop where you can purchase official Dekmar Trading t-shirts, hats and hoodies. 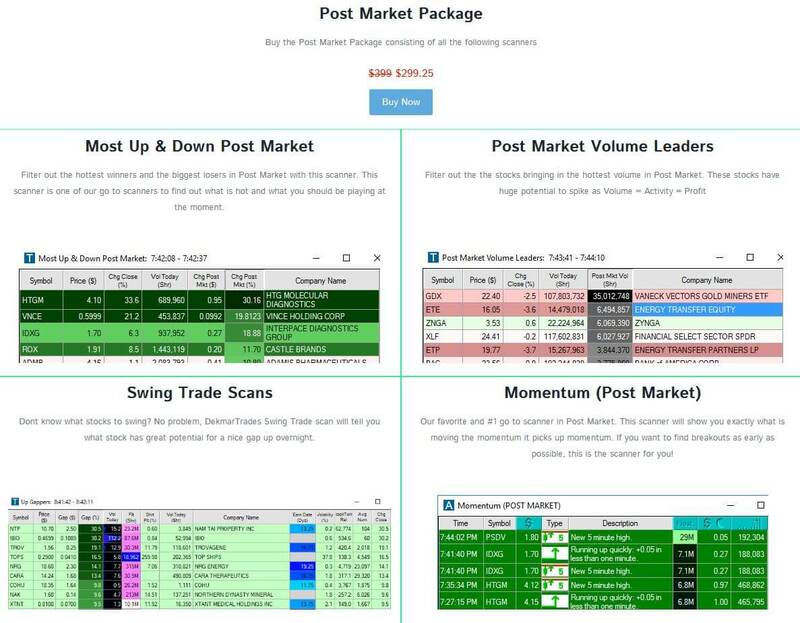 Dekmar’s two main products/services are his collection of proprietary Stock Scanners that range in price from $111.75 to $449.25 and his TradeCaster Live Trading Stream. It’s important to note though, Dekmar writes the code for his scanners, but he needs the Trade Ideas platform to make them functional. Thus, you need a Trade Ideas Subscription. Plans range from $2.90 per day for standard annual plan or $6.20 per day for a premium annual plan. Combined, the tools scour pre-market trading to let you know which stocks are advancing/declining and the volume associated with each. This is essential information for any trader as it gives you a glimpse into the daily sentiment for equities and the overall mood music of the market. From a cost perspective, it’s reasonable. If the product functions as designed, the trading data you receive will more than pay for itself. Take a closer look and see if it’s right for you. The Most Up and Down Post-Market scanner tallies historical data on the largest advancers and decliners of the day. Here, you can assess which stocks rallied and which stocks faded after the bell. The Post-Market Volume Leaders acts as your sentiment survey. It tells you which stocks garnered the most attention and had abnormal volatility. The third tool -- Post Market Momentum scanner -- breaks down which stocks had increased momentum and which stocks lagged. Again, this data is beneficial when analyzing trends that occur outside of historical norms. The last product in the package is the Swing Trade Scans. Using Dekmar’s algorithm, this scanner advises you which stocks are primed for short-term price reversals. Unlike the other three above, the Swing Trade Scan should be taken with a grain of salt. Dekmar’s algorithm and its pre-programmed indicators will essentially act as your trading advisor. This can be risky, so if you choose to run it, we recommend you give it a few practice sessions or back-test the results before betting any real money. Outside of that, the products are solid. Like the pre-market package, the data you’re getting is invaluable. If the scanners work as promised, $299.25 is well worth the price. The Live Trading Package is Dekmar’s scanner-utopia. Each product can be purchased on it’s own (except for 5 Min Reversal and Low Float) for anywhere between $111.75 to $149.99. But collectively, the total package comes in at $449.25. What differentiates this offering from pre and post-market packages, is the Live Trading Package is well – live. It’s in real time. The Top Gainers/Losers scanner reports which stocks are advancing/declining in the current trading session. The Mid Candle Breakout Pattern/Bull Flags uses Dekmar’s algorithm to predict breakout patterns and profitable trade spikes; the scanner will identify potential trade targets, but again you should test it out to gauge its accuracy. The High of the Day Momentum Scanner reports which stocks are advancing while at the same time showing above average momentum. The Breakout Scanner is also a vital tool. It lets you know which stocks are moving outside their support and resistance levels; once a stock breaches – and holds – a new level, you can profit from further upside (on the long end) or downside (if you’re short). The 5 Min Reversal scours the markets to find stocks prime for short-term reversals; you’ll get profitable short plays and guides for entry and exit points. Consecutive Candles is a longer-term indicator. It provides data on which stocks are consistently rising (green candles) and what stocks are consistently falling (red candles); this way you follow longer-term/less volatile rallies and downswings. This low liquidity effect means large upward and downward spikes are more likely and provide more opportunities for traders; the Low Float scanner charts each stocks and tallies volume data as well. Previous Day Runners is another trend following scanner; it tallies the previous day’s top gainers to identify which stocks have historical momentum on their side. Last on the docket is Parabolic Movers. Parabolic moves are percentage gains and losses that increase in magnitude (exponentially) the longer a trend is in place. The scanner will hunt down stocks showing these tendencies and tally the data for you. Undeniably, the Live Trading Package offers the most bang for your buck. Data is king and this package has you covered from all angles. ​But do you really need all of these Dekmar Trades scanners? Well, the answer depends on how serious you are about trading. If you believe in Dekmar’s algorithms and its ability to find winning opportunities, then one scanner alone will pay for the entire package. Top Gainers/Losers and the High of the Day Momentum Scanner, the total cost is $411. For an extra $38.25, you get the entire package, seven extra scanners and without question the best value in the offering. Again though, you first need a Trade Ideas Subscription for the scanners to function, so figure that into your budget. Dekmar’s TradeCaster Live Trading Stream is a real-time trading session where you get to watch him in action. More importantly, you’ll get a chance to see how the scanners work in practice and how he uses them to turn a profit. 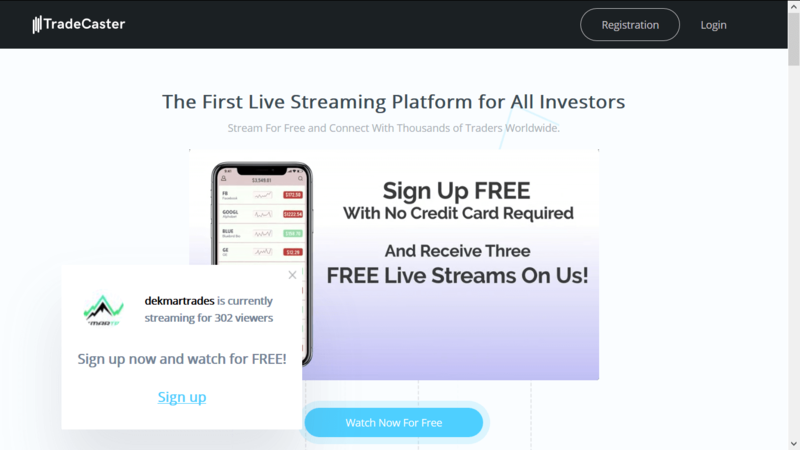 TradeCaster – the streaming platform -- is a pay-per-view site where traders set their own price for content and users are able to purchase individual sessions. The best part of the service is it’s free to join and when you sign up, you receive three free live-stream tokens. These tokens allow you to watch three Dekmar trading sessions – free of charge – which will give you all the data you need to make an informed decision. For us, transparency is a crucial variable in our rating methodology and by allowing a free trial, Dekmar passes the test. By putting his skills on display, he’s leveraging his trading ability to gather a following rather than using false or misleading marketing. All in all, we think you should give it a try. As mentioned above, Dekmar’s trading platform offers three free live-streams when you sign up. Free trials speak to the authenticity and integrity of any trading service, so it shows Dekmar is on the right track. His site also offers free content on its blog but the content is outdated. Coupons and Promo Codes: n.a. ​Dekmar Trades is most useful for anyone with a passion for trading penny and micro-cap stocks. Small issues are embedded with volatility, but when it comes to day trading, then volatility is your best friend. Significant increases and decreases provide ample opportunities to profit, and Sean claims he can help you exploit these opportunities. If you’re looking for a proprietary strategy or a little guidance on how and what to look for, Dekmar can help you out. And with three free streams, you can try before you buy: that way you decide if he’s worth the money. Instead, we recommend to check out the Trade-Ideas review to find out, if Trade-Ideas might be a powerful tool along with the other free services Trades Ideas provides. The chances are that you do not need Sean Dekmars scanner settings because you create them on your own or use Trade-Ideas pre-configured ones. However, if you are looking for pre-configured scanners, then also Ross Cameron can help you out at Warrior Trading. Check out the latest Warrior Trading Review to see, if this is a smart alternative to Dekmar Trades for you. ​We’re really skeptical when it comes to gurus claiming they have the key to your financial freedom. Many trading providers spend more time on misleading marketing than actually teaching and helping investors. But Sean Dekmar has more positives than negatives. His scanners provide you with invaluable data that all traders need to survive. Trading is like being stranded on a remote island: you’re scared, you’re uneasy, but at least with the stock scanners you have the tools to survive. The costs ​ranging from $111.75 to $449.25 for the Live Trading Package​. ​The key question is if you really need his pre-configured scanners since Trade-Ideas provides similar scanners for free. If you want to use Dekmar Trades services, you need ​a ​Trade Ideas Subscription. Finally, it is a bit hard to find any details about the company behind and the payment terms. We cannot tell you right now if there is a money back guarantee, what the conditions are etc. Payment terms are, and Dekmar Trades doesn't have them available right now.